A total of 7,100 miles with NO tickets, NO fall downs and only minor repairs along the way. I love it when a plan comes together. NVAR 2010 is in the bag. Stay tuned as my Web guy gets everthing posted. It's worth it! Send a message and I'll post it to my Website. Milo, Great riding next to you again. Always a memorable experience. You are a true ambassador of the riding world. Two of my friends and I caught up with you on I80 on June 3rd, west bound just inside the Utah state line. Was checking out that rat bike on the way past. Whatta great ride! You fell in behind us until you peeled off on I84. Bike sounds great, looks awesome. Hope to run across you again on the road. Happy trails! Milo, It was an unexpected pleasure running into you last night. My young friend was very impressed with both you and your bike. I posted your Rat Bike web address on a local riding groups web site this morning so they can all become acquainted with your travels and adventures. Here's hoping you have a pleasant and uneventful journey home. Hope to see you again as I'll be visiting the Oregon coast again in September. Great to ride again across this great nation with you .This is the 5th year and it just keeps getting better.Hope to see ya soon my brother.Tamie says hey and she loves ya!Tell Jonie we love and miss her. Hey Milo, Love your reports on the road from you to Washington DC. I'm at least one good fan... Thanks. You won't remember us but we were next to you last year in the parade through Washington for Rolling Thunder. We didn't see you here this year and missed you. Last year as we were rolling through the streets my wife and I were watching (and taking pics) the expressions on the peoples faces who were looking at you. It was a scream! We had a GOOD time. Hope all is well, perhaps we will see you here next year. Take care and be well. Milo, It was good to see you again. Hope the trip home is safe and full of new wonderful experiences. Look for you next year. Milo, Thanks for the words of appreciation for a beautiful Memorial. I look forward to talking to you soon. Thanks again. Thanks for coming to the Iowa Veterans Home. You and the group really made our veterans day. G. Eubanks currently in Iowa, from N.C.
Just saw you at the Pilot in Brooklyn Iowa , parked my semi and checked out your bike when I came out you where already leaving but I snapped a pic. Anyway just wanted to say cool bike. Take care. Drew, Hollis, Craig and Milo are hauling up Hwy 5 North of Roseburg headed for Washington. I'm Drew and I'm leading on my 2003 Electra Glide Standard; a plain Jane but a good bike with 75,000 miles on it. We've been doing 80 Mph for almost 2 hours when Milo pulls up next to me yelling he has to pull over. I can see he is holding the bare end of a wire to his ignition switch on the Rat Bike's gas tank. When he lifts the wire off the bike dies, when he puts it back on it runs fine. I'm not in the mood to stop for little fix's right at the moment but I've got an idea that should work at 80 mph. My left hand goes into my fairing bag and comes out with a clothes pin that I hand Milo without skipping a beat. Milo about falls off his bike laughing and clips the wire to the switch. We were good for 10 more miles, found a good place to stop and put a new connector on the wire with a leatherman. He returned the clothes pin. What a gentleman and always fun to ride with. See you soon. Saw you earlier this month on I-5 south escorting the young sailor home. Thank you and all the other bikers for doing that for our soldiers. Hi ya… just a quick question; How many miles have you done on that bike?? Thanks for the Smile for him. Have you SIGHTED Ratbike Milo? TELL us about your experience, it is sure to be unique. Milo's adventures on the Ratbike are detailed in his unbelievable, heartfelt and hilarious JOURNALS. 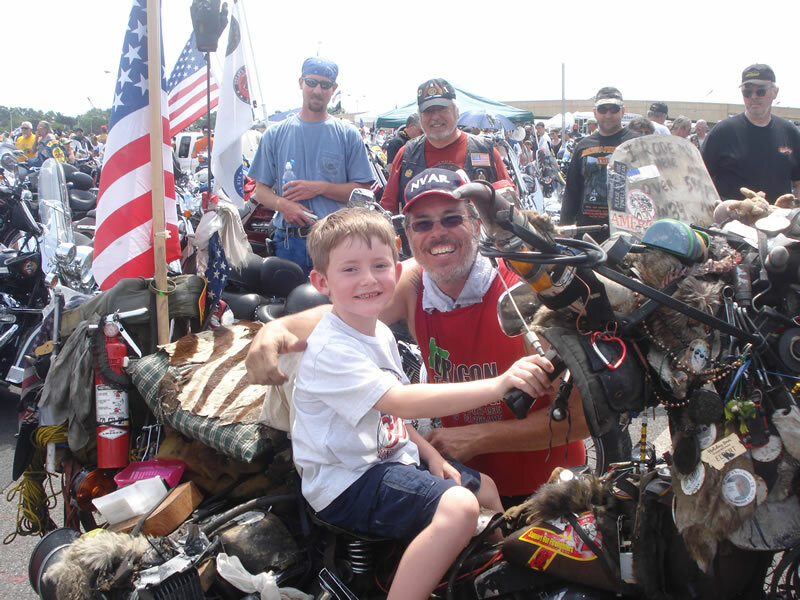 Journals from all of Milo's NVAR Rides can be found here.